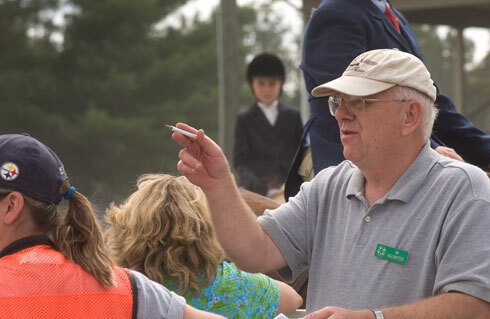 A 4-H volunteer provides assistance at the Virginia State 4-H Championship Horse and Pony Show in Lexington, Va. According to a report from Independent Sector, more than 12,000 adults and teens volunteered for Virginia 4-H in 2008. BLACKSBURG, Va., Sept. 21, 2010 – Virginians will celebrate the accomplishments of the more than 36,000 Extension volunteers who donate their time and talents to the people of the commonwealth every year, following Gov. Bob McDonnell’s declaration of October as Virginia Cooperative Extension Volunteer Month. The governor’s proclamation acknowledges the value of Extension volunteers to Virginia citizens and salutes the state’s Extension Leadership Councils (ELCs) – groups of citizens who help design, implement, and evaluate Extension’s community-based programs. According to a report from Independent Sector, more than 36,000 Extension volunteers donated more than 1.1 million hours of their time in 2008, valued at nearly $24.6 million. This includes volunteers from the Master Gardener program, established in 1979, and the Master Food Volunteer program, established in 2010. Week 1: 4-H volunteers, coincides with National 4-H Week, Oct. 3-9. Week 2: ELC members and community viability volunteers. Week 3: Agriculture and natural resource volunteers. Week 4: Family and consumer science volunteers. For more information about volunteering in your area, contact your local Extension office. Virginia Cooperative Extension brings the resources of Virginia's land-grant universities, Virginia Tech and Virginia State University, to the people of the commonwealth. Through a system of on-campus specialists and locally based educators, it delivers education in the areas of agriculture and natural resources, family and consumer sciences, community viability, and 4-H youth development. With a network of faculty at two universities, 107 county and city offices, 11 agricultural research and Extension centers, and six 4-H educational centers, Virginia Cooperative Extension provides solutions to the problems facing Virginians today.